Some really fun and amazing things have been happening since my book launched mid-December. 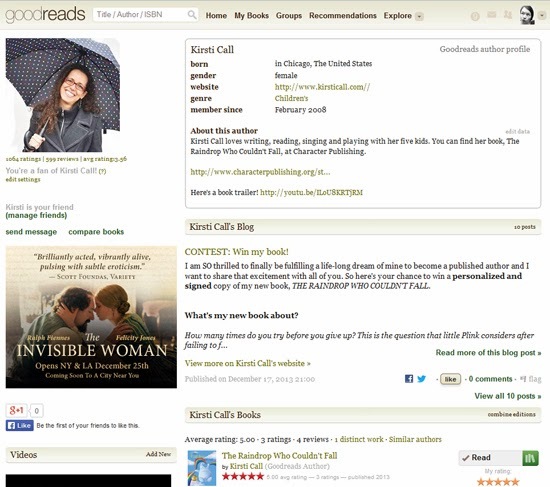 One of my favorite new experiences has been setting up my Author Page on Goodreads.com and having others rate my book! You can find my Author Page here! Please become a "Fan". I would love to share my love of all books with you. 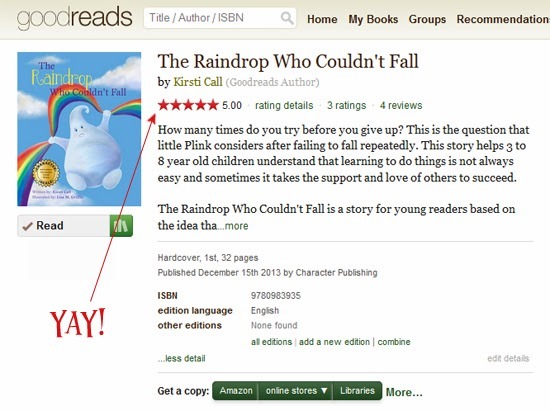 There is also an official listing for THE RAINDROP WHO COULDN'T FALL. Reviews are beginning to roll in and I am happy (no, thrilled) to see that the book has all 5 star reviews so far! You can see the book's listing and leave a review after reading by clicking here. Hope to see you on GoodReads! Thank you SO MUCH for all of the entries! It made my week to see interest in winning my book. Please consider buying a copy of your own by clicking here. I am SO thrilled to finally be fulfilling a life-long dream of mine to become a published author and I want to share that excitement with all of you. 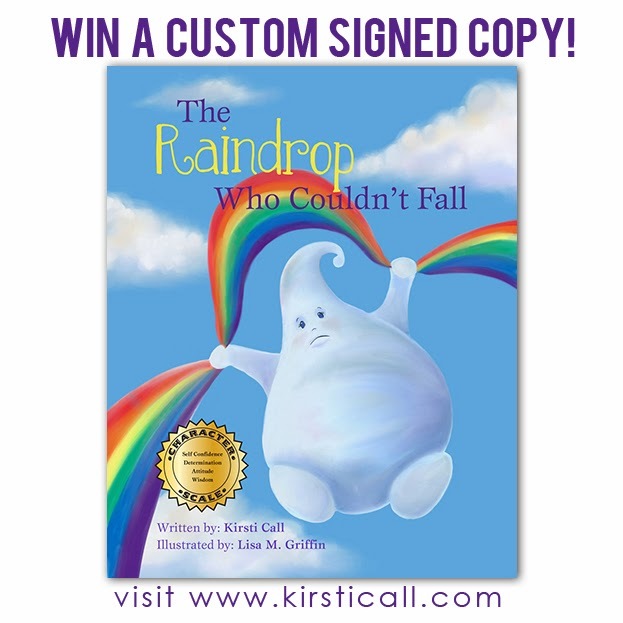 So here's your chance to win a personalized and signed copy of my new book, THE RAINDROP WHO COULDN'T FALL. What's my new book about? How many times do you try before you give up? This is the question that little Plink considers after failing to fall repeatedly. This story helps 3 to 8 year old children understand that learning to do things is not always easy and sometimes it takes the support and love of others to succeed. 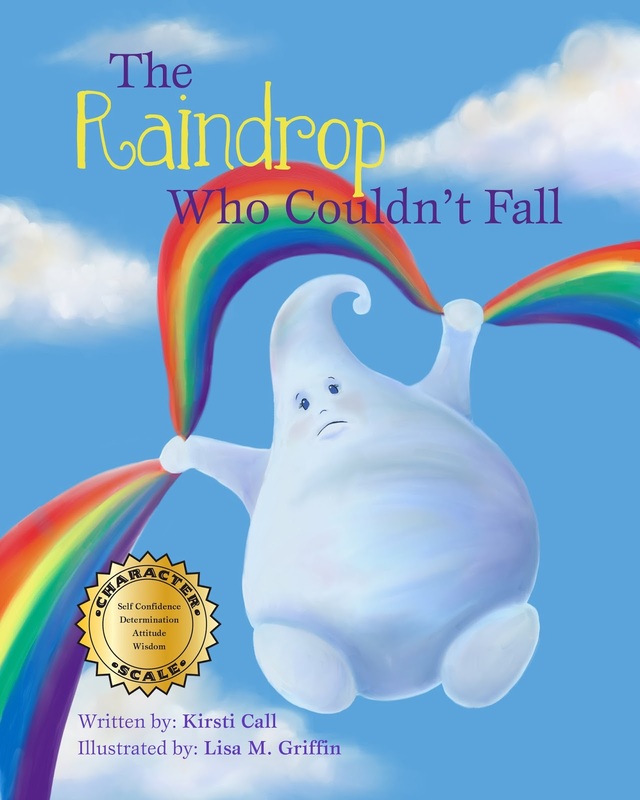 The Raindrop Who Couldn't Fall is a story for young readers (3-7 years) based on the idea that changing your thought patterns can change the outcome of events in your life. The main character, Plink, is unable to fall from her cloud until she changes the way she thinks about falling and starts to believe in her abilities. Please fill our as many entries as you wish using the form below. If you choose to share this contest via Instagram or Facebook, use the image above for your entry. This contest ends at 11:59 pm EST on December 23rd. 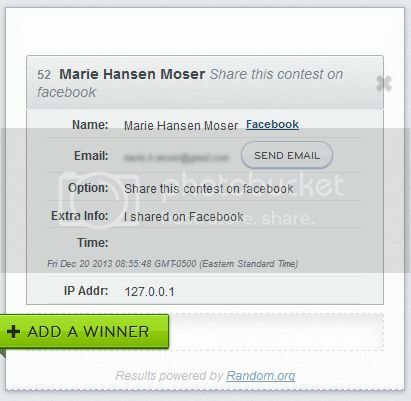 Winner will be notified via email. THANK YOU for your support and enthusiasm! Today at my book launch I felt grateful as I read my story to a throng of supportive people. After Storm Electra ravaged the boston area, I didn't expect much of a showing, but people came! It only took me 38 years to become an author! All those years of reading and writing and reading some more paid off. Now my book is on the shelves of my local bookstore, available at character publishing and soon to be available on Amazon. Although the cake was red when we went to pick it up, that mishap was quickly resolved. My son James took some fantastic and artistic pictures. Several writer friends showed up too! Thank you to all of you who who've helped me along the way. I feel privileged to know you. I'm thrilled to announce that my book launch party is on the day my book comes out! On December 15th, 2013, I will be at the Andover Bookstore at 1:00pm! Yay!!! I'm entering Susanna Leonard Hill's Halloweensie contest this year. The challenge is to write a story with the words "spooky", "black cat", and "cackle" in 100 words or less. Here's my attempt. Spooky the black cat coughed. Why was she always sick on Halloween? She cleared her throat and sputtered. Today she would compete in the cackling cat contest. How would she win, if she couldn’t even meow? Spooky sipped tea with lemon. Uggghh! She spat it out. Whoever said tea was helpful for a cold? Spooky hissed into the mirror. She still looked like a scary black cat, even if she didn’t sound like one. She joined the cat circle and arched her back. Spooky’s scratchy, croaky cackle made the other cats shiver. Perhaps being sick wasn’t so bad, after all. The Raindrop Who Couldn't Fall, Book Trailer! The Raindrop Who Couldn't Fall, COMING DECEMBER 15th! Thanks to Paul Czajak for inviting me to participate in this blog hop. Paul got an ‘F’ with the words “get a tutor” on his college writing paper and after that, never thought he’d become a writer. But after spending twenty years as a chemist, he knew his creativity could no longer be contained. His first picture book, Monster Needs A Costume, illustrated by Wendy Grieb was recently released through Scarletta Kids. This is the first picture book in the Monster & Me series (all of which will be illustrated by Wendy), with the second, Monster Needs His Sleep due April 2014 and then Monster Needs A Christmas Tree set for September 2014. He has also recently signed a contract for Seaver the Weaver which will be illustrated by Ben Hilts of The Hilts Brothers and is planned for April 2015. Lately, I've been working on several stories about magical sneezes. When I was born, I sneezed instead of crying. Sneezing's still a pretty big part of my life right now, so I thought I'd write about it! How does it differ from other works in the genre? These two stories are extremely silly and fantastical. One is about a boy whose sneezes change things around him. The other is about an airplane who sneezes people to the wrong destinations. Both stories are completely ridiculous and unique. I write picture books because I love how a short story can change how you think and feel about something. I love how kids laugh and learn from stories that may not even have a clear driving message. I also have very short periods of time in which I can write because of my five kids. Picture books are perfect for me right now. What is the hardest part about writing? The hardest part about writing is the dozens of rejections. The form letter rejections are the worst! But I actually get kind of excited about rejections that are personal. At least the really read the story, right? Please check out Tracey Cox, who is continuing the blog hop! Tracey M. Cox has been telling stories since she could babble. In school, she always loved creative writing assignments in, but never thought of taken her writing past a grade until... many years later her oldest son said the magic words, "Mom, THAT would make a cool book!" Since that time many, many moons ago, Tracey has taken her writings on many adventures. She has been published in newspapers, magazines, anthologies, and BOOKS! Tracey enjoys attending festivals, guest speaking about literacy, going to businesses for book signings, and visiting schools in person or by Skype online visits. You can read all about Tracey M. Cox, and her books, on her website: www.traceymcox.com . Why do you write what you do? I write picture books, because that is my life right now! I have five kids ranging from 3 to 11 years old and they all enjoy a good picture book. I love reading and writing picture books because it's perfect for our chaotic house--I can almost always find just a few moments to read or write a short story! What is the hardest part about writing? The hardest part about writing is the dozens of rejections. The form letter rejections are the worst! But I actually get kind of excited about rejections that are personal. At least the really read the story, right? What scares you? I guess I'm scared of letting the momentum of life make my choices for me. I want to make sure that I'm fully present. I don't want to look back and regret how I spent my time. I want to be able to say, I focused on my kids and my family and what's truly important in life. Interview with Christine Marie Alemshah, author of "Right This Instant"
What inspired you to write Right This Instant? It was a combination of two ideas really. First, I observed how children and adults alike have embraced this notion of having things right away due to use of computers, smart phones, fast food, etc. Secondly I overheard older relatives speaking in awe of my two year old’s nieces ability to pick up a smart phone and know exactly how to use it as a camera. I thought, you know there’s a story there. I let the idea percolate for a while and eventually ‘Right This Instant’ was born. Right This Instant is your debut picture book. How long did it take for this story to be accepted for publication? The submission history has an interesting story behind it. I submitted to an editor in 2011. Several months later I received her response. The story wasn’t right for that publisher, but she did provide valuable feedback regarding the ending. I stopped submitting for several months and really took a good look at what I could do differently. Then I sent it to my writer’s group who agreed the changes were for the better. I went out on submission again, and MeeGenius thought it was a wonderful story, but, unfortunately, weren’t taking on new clients until the New Year. I contacted them again in early 2013 asking if they were still interested, and this time I received an acceptance! You have a couple of picture books coming out digitally. How you feel about e-books versus print books? It’s actually funny. When I first got my own kindle I resisted reading e-books. I didn't think I'd ever get used to it not feeling or smelling like a real book. Now I love it. I even read on my iphone sometimes. Digital publishing is a new frontier, and I am happy to be a part of it. What would you like children to learn from your stories? My main goal is for children to develop a lifelong love for reading. I hope they enjoy the silliness or emotions portrayed in my stories and that they fall in love with the characters. I have three picture books in the revision process right now. I’m also trying to get caught up on Julie Hedlund’s 12x12 picture book draft challenge this summer. What is most challenging for you as a writer? I like to type my first drafts, so for me avoiding social media during writing time is the most difficult thing. Sometimes I need to research an idea, and if I’m not careful I will end up on facebook instead of the information page. My best writing time happens in the morning when I’m wide-eyed and dewy. My mind is the most open and receptive to embracing the creative thread and letting loose a new story. This is tough to choose just one. I have lists of all my favorites! If I had to choose the one that impacted my life the most and just wowed me with what was possible in creative writing, it would be JRR Tolkien’s Return of The King. Right This Instant is now available here from the MeeGenius Bookstore or at the MeeGenius App for ipad, iphone, android, or Google TV. I'm excited that fellow children's writer, Christine Marie Alemshah, interviewed me for her blog this week! Check it out at here. The Raindrop Who Couldn't Fall is now available for pre-order! You can now pre-order my book here. I've finally finished my welome video. Enjoy! My first guest blog experience! Today my words are posted on Julie Hedlund's blog. Thanks for the opportunity Julie! His books were the closest thing he had to furniture and he lived in them the way other men live in easy chairs. I'm thrilled to announce that my picture book, The Raindrop Who Couldn't Fall, is coming out October, 2013. I'm excited to be working with Character Publishing and I love the illustrations that Lisa Griffin created for my book. The content on these pages, including text and images are the sole property of the author unless otherwise noted and may not be used or reproduced in any manner without consent. All Rights Reserved.